No driver in any form of motorsports can enjoy success on the track without a dedicated pit crew working behind the scenes. That was especially true with NASCAR legend Bill Elliott and the close-knit group of team members that kept his No. 9 Fords in the win column for 15 seasons. From 1976 through 1991, Elliott Racing and Melling Racing established themselves as winners and champions through 34 victories as well as 116 top-five and 195 top-10 finishes. Those crewmen also helped build and prepare the cars that Bill drove to win the lucrative Winston Million bonus in 1985 at Darlington (S.C.) Raceway and the Winston Cup championship in 1988. Local friends and neighbors from Dawsonville, Ga. and surrounding towns offered their time and talents and built one of the greatest dynasties in NASCAR history. More importantly, each one was thought of as a member of the Elliott family, which still holds true to this day. Mike Brandt, fabricator and gas man with the famed No. 9 team over two stints (1983-91, 1996), remembered many rewarding years with the Harry Melling-owned operation. Brandt remembers not only the comradery felt among team members, but also the seriousness of the job at hand. What made them great was how they believed in each other and their collective mechanical talents. 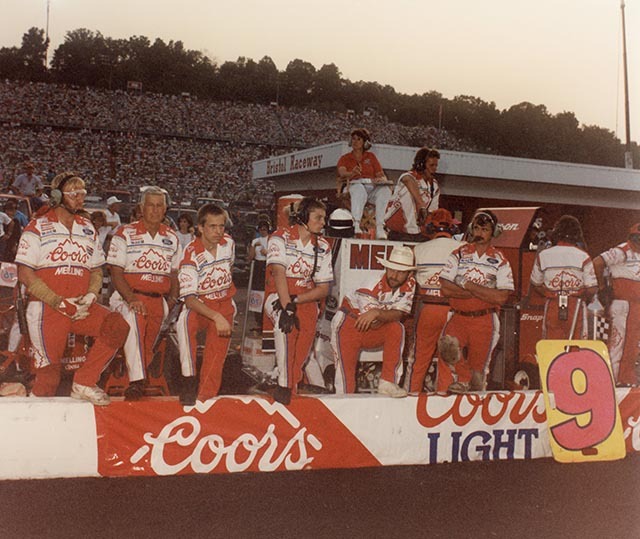 So much so that Melling Racing won the UNOCAL Pit Crew Championship competition at North Carolina Motor Speedway in 1982 and again in 1990. 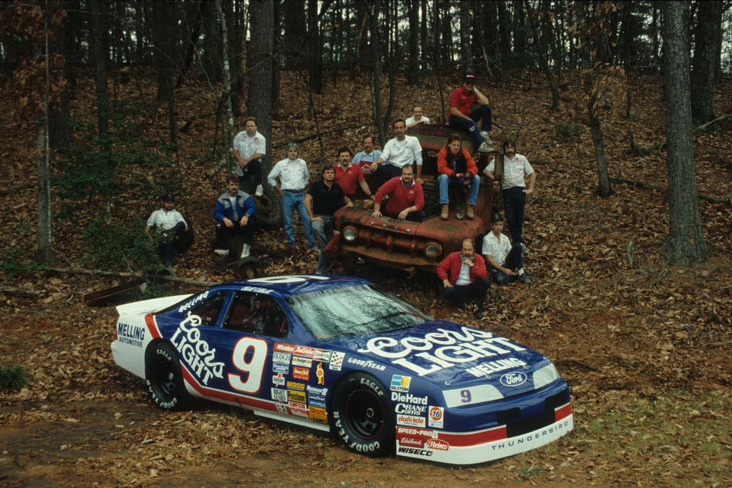 The winning crew of 1990 consisted of Mike Brandt, Clinton Chumbley, Tommy Cole, Dan Elliott, Ernie Elliott, Mike Rich, Doug Shook, Mike Thomas and J.W. Waldrop. Rich lost his life in a pit road accident at Atlanta Motor Speedway on Nov. 18, 1990. Russ Bales became a tire changer with Melling Racing in January of 1991 after Rich’s death. “I pretty much knew all of those guys from being the Snap-On tool guy,” Bales said. “I would go in and out of their shop and they would be there practicing. I had told Ernie, Bill and Dan I’d be interested in helping. Ernie had built some engines for a guy named Bob Penrod, running in IMSA (International Motorsports Association). That’s when I started working on race cars for a living. Like all other members of the small team before specialists and engineers became commonplace within NASCAR’s Cup series, all members of the Melling organization were versed in a variety of jobs. For Gerald “Bugs” Swafford, the team truck driver and windshield washer during pit stops, winning the 1988 Cup championship will be a milestone that will always be cherished. Swafford continues to feel the Elliotts are family. That feeling goes back to his early childhood when he knew George as “Mr. Elliott” in the school hallways. “Their Dad, George, was the principle where I went to elementary school,” Swafford said. “We always knew them. My Dad and their Dad were real close friends. When I got married in 1967, everything that we used to build our house came from the Elliott’s building supply store. So we’ve known each other a long time. The stories of success the that Elliotts and their beloved crew enjoyed in the 1980s and 1990s will live on in NASCAR history forever.